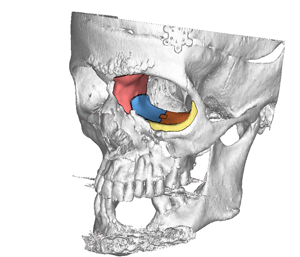 A Connecticut company wants to take more market share in the custom cranial and facial implant world. The established names in the world of custom cranial and facial implants are the likes of Biomet, Stryker and Synthes. However, there are small, boutique firms as well that compete with the big guys for the surgeon's mindshare. One such small manufacturer with roots in aerospace mechanical engineering and rapid prototyping wants to make a big play in 2015 by taking a large chunk of the revenue pie. Kelyniam, based in Canton, Connecticut, believes it can do that because of a combination of rapid turnaround times and ease of implant placement. The company has been selling its custom implants made of polyether ether ketone (PEEK) OPTIMA, a colorless organic thermoplastic polymer that is transparent to X-rays, since January, 2012 after obtaining approval from the FDA in April, 2011. That gap was meant to ensure that Kelyniam could create a scalable product development and manufacturing process, says Tennyson Anthony, president and CEO of the company in a recent phone interview. “We are very confident that we can handle a significant volume without a hitch” or increase in turnaround times, Anthony declares. Since 2012, roughly 400 procedures have involved Kelyniam’s implants. The company has market clearances in the U.S. and the Middle East, and the company is working to obtain regulatory clearances in Canada and Australia. The goal is to have significant growth in 2015 and gain a foothold in the facial implant market as well, where most implants are typically off-the-shelf products. So what is Kelyniam’s turnaround time? From the time that the company receives a CT scan to when the implant is available for surgery can take as little as 24 hours. Kelyniam executives underscore that the rapid turnaround time is a competitive advantage. Other implant makers take several days if not weeks to produce their implants. A plastic surgeon says it’s not that common for facial implants to be custom made. Usually off-the-shelf products work, but when they need to be custom made that takes some time. “These custom implants generally require several weeks before being available. The facial plastic surgeon works with the company to create an appropriate implant,” says Houtan Chaboki, plastic surgeon, George Washington Medical Faculty Associates in Washington, D.C, in an email. But cranial implants, sometimes can be made "on the spot" by head or neck surgeons, neurosurgeons or plastic surgeons using a“combination of titanium plates and/or hydroxyapetite or similar material,” he explains. Kelyniam’s website offers three plans for custom cranial implants – an expedited plan whose turnaround time is 24 hours, a second plan by which the product is ready for the surgeon in 72 hours while a third plan makes the implant available in five or six days. Another company – Kelyniam competitor Dallas-based MedCAD - that also makes implants using PEEK polymer can produce them in a few days. “Is it humanly possible to create an implant within 24 hours? Yes, but it’s not necessary,” says Nancy Hairston, CEO of MedCAD. She says that her company’s products are rarely used in emergency trauma scenarios because typically you have to wait for the swelling to go down. “To be honest, if they need it in 24 hours that means somebody hasn’t been organized and they are rushing to bring the patient in,” Hairston declares. For Kelyniam, the market is split 50-50 into trauma cases and implants required as a result of diseases such as tumor resections, Anthony explains. “One of the things that we feel sets us apart from our competition is that we are having great success in working with the surgeons and designing an implant even before the resection so that it can be done in one surgery, where the surgeon goes in and takes the tumor out and then have the implant right there to put in,” he says. One of the company’s products is an implant with tabs already in place. And that becomes important at a time when hospitals are making purchasing decisions with a laser-like focus on cost containment. Kelyniam's outside spokesman noted that the 24-hour turnaround time also helps to free up hospital resources because it means patients are spending less time in the hospital waiting for the implant depending on the type of case. Recently, the company helped create an implant for a U.S. patient that was particularly challenging. The patient had a gunshot wound, and from the CT scans, it was fairly obvious that there had been a previous surgery to secure broken bone, says Merwin Schaefer, Kelyniam’s chief design engineer. “The part was created to mimic normal functioning of a healthy bone while reducing surgery and patient recovery times,” Schaefer says. In fact, the final implant was a puzzle of four different pieces. “The pieces were all slipped through a small incision and assembled once inside, which greatly reduced scarring and swelling and provided for a much better structural and aesthetic outcome,” Schaefer says. Schaefer and company executives declined to say where the surgery was done because they are not at liberty to disclose details. Already some physicians are noticing the Kelyniam difference, Tennyson says. “We have had a doctor tell us that he truly believes that we saved a couple of his patients' lives because they came in and they were diagnosed with a tumor and they needed radiation treatment right away and because we were able to turn around the implant [quickly] that patient could receive the treatment within 48 hours,” he says. Executives are hoping that such experiences will have a big impact on the company’s financial fortunes in 2015. The hope is also that a recent acquisition which brings the ability to bring to market neurostimulation products will boost financial results. In the third quarter, Kelyniam had sales of $455,401 with a loss of $72,302. Kelyniam went public in 2008 and its stock is available over the counter. Meanwhile, as it competes with companies like MedCAD, Kelyniam will also have to contend with the likes of Oxford Performance Materials, which has won FDA approval for its 3-D printed cranial and facial implants.